Presidential office rejects opposition claim that Moon’s approval of Pyongyang Declaration violates Constitution. 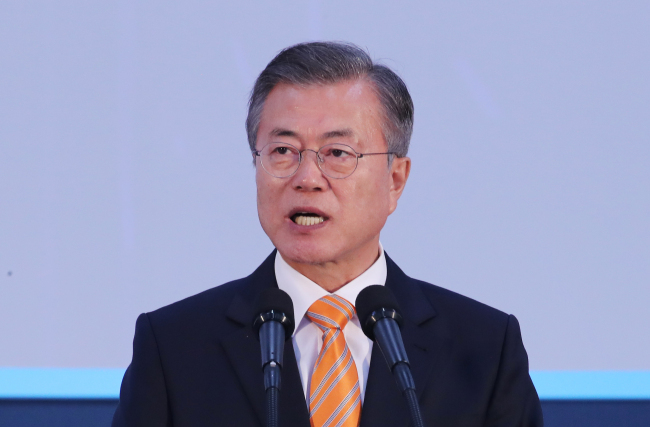 Controversy continues to escalate over President Moon Jae-in’s decision to approve a landmark rapprochement agreement with North Korea, with Moon’s office saying that inter-Korean deals are not subject to parliamentary approval under the Constitution. Following a Cabinet meeting Tuesday, President Moon ratified the agreements he made with North Korea’s leader, Kim Jong-un, during his visit to Pyongyang last month. They include plans to implement a series of arms-control measures and inter-Korean infrastructure projects. Opposition conservative parties cried foul, criticizing Moon for violating the Constitution by ratifying what they saw as “dangerous deals” without parliamentary approval. They warned that the inter-Korean agreement would undermine national security and waste taxpayers’ money. “President Moon has made a unilateral decision about a constitutional issue that has grave impact on the national security,” Rep. Kim Sung-tae, a floor leader of the main opposition Liberty Korea Party, told reporters Wednesday. Cheong Wa Dae fought off claims that Moon violated the Constitution that mandates parliamentary approval for international agreements that place a significant financial burden on taxpayers. The Pyongyang agreement includes a plan to jump-start the inter-Korean project of connecting roads and railways across the border. It also said the two Koreas will reopen the Kaesong industrial park, an inter-Korean economic venture, and resume tourism at a mountain resort at Kumgangsan. The presidential office asserted that deals with North Korea do not require parliamentary approval since South Korea’s Constitution does not consider them international treaties signed between sovereign states. Such a view was applied when the country’s top court made a ruling about the inter-Korean nonaggression agreement in 1991, spokesperson Kim said. The Supreme Court concluded in 1997 that the 1991 deal is not a treaty subject to lawmakers’ approval. Given the Supreme Court’s past rulings, the inter-Korean deals should be interpreted in accordance with the 2005 inter-Korean relations law, which specifies limitations on the need for parliamentary approval, Kim said. “The law says there are only two cases where parliamentary approval is required. The first is when it imposes a financial burden and the second is when it creates a law,” Kim said, stressing that neither applies to the Pyongyang agreement. The debate comes amid the stalemate over the parliamentary approval of the Panmunjom Declaration, which Moon and Kim signed in April during their first summit at the border village inside the Demilitarized Zone. While the government has submitted a motion for parliamentary approval for the Panmunjom Declaration, opposition parties are refusing to ratify the pact out of concern that it would incur massive burdens for the taxpayers. Asked why the government had sought parliamentary approval only for the Panmunjom Declaration, the presidential office said the agreement’s financial impact was much more significant than that of the Pyongyang Declaration. “We need parliamentary approval for the Panmunjom Declaration, as it creates a significant financial burden,” spokesperson Kim said, adding that the government has its own standard for determining what constitutes a significant financial burden. Cheong Wa Dae has said the Pyongyang Declaration would not create any additional financial burden, as most of the agreement deals with the implementation of the Panmunjom Declaration — for example, holding a groundbreaking ceremony with North Korea for projects to reconnect roads and railways.